Located in Goslar Rural District, this spa condo resort is within 1 mi (2 km) of Burgberg Cable Car and Harz Golf Club. Brocken and Harz National Park are also within 12 mi (20 km). Bad Harzburg Station is 26 minutes by foot. Located in Goslar Rural District, this luxury hotel is within 1 mi (2 km) of Harz Golf Club and Burgberg Cable Car. Harz National Park and Oker Dam are also within 9 mi (15 km). Bad Harzburg Station is 8 minutes by foot. Located in Goslar Rural District, this spa hotel is within a 15-minute walk of Burgberg Cable Car and Harz Golf Club. Brocken and Harz National Park are also within 12 mi (20 km). Bad Harzburg Station is 19 minutes by foot. Located in Goslar Rural District, this golf hotel is within 1 mi (2 km) of Harz Golf Club and Burgberg Cable Car. Brocken and Harz National Park are also within 12 mi (20 km). Bad Harzburg Station is 15 minutes by foot. How Much is a Hotel Room in Bad Harzburg? Hotels in Bad Harzburg start at $66 per night. Prices and availability subject to change. Additional terms may apply. Within a 6-mile (10-kilometer) radius of the middle of Bad Harzburg, through Travelocity's booking page you can unearth a small, but excellent selection of accommodations. The center of Bad Harzburg boasts 5 well regarded hotels and apartments within 6 miles (10 kilometers). Rooms within walking distance of Bad Harzburg's city center, are the Braunschweiger Hof and Vitalhotel am Stadtpark. 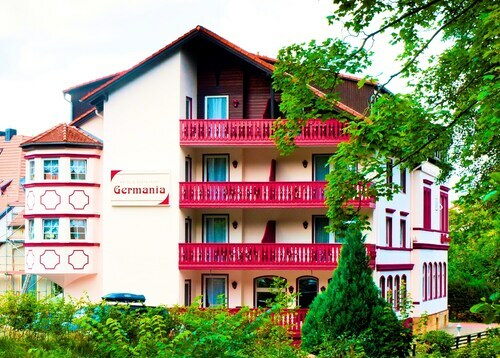 One of the small number of economical hotels in Bad Harzburg is the Wellnesshotel Germania. 10 miles (16 kilometers) outside of central Bad Harzburg, you will come across the Ringhotel Weißer Hirsch. Alternatively, the Landhaus Zu den Rothen Forellen is about 5 miles (8 kilometers) away. Alternatively, you may like to check out the amenities and rates at the Travel Charme Gothisches Haus or the Rilano 24 7 Hotel Wolfenbüttel. Planning to make your way a little out of the center? Saxony-Anhalt offers a number of things to see. Saxony-Anhalt is marked by forests and rivers, and other popular visitor sights include castles and old towns. In this part of Germany adventurous visitors can enjoy snowboarding, skiing and cross-country skiing. On the hunt for things to do? Consider spending a few hours visiting Goslar Imperial Palace and Mines of Rammelsberg, which can be found in Goslar, 7 miles (11 kilometers) west of Bad Harzburg. Goslar accommodations include the Altstadt Hotel Gosequell and RAMADA Hotel Baeren Goslar. Alternatively, you could stay in Sorge, 15 miles (24 kilometers) to the south of Bad Harzburg, where you can choose from the Hotel Tannenpark and Landhausferienwohnungen Am Brockenblick. The Grenzlandschaft and Museum Sorge and Ring der Erinnerung are popular points of interest to visit while in Sorge. Why not spend a few hours hanging out with Harz supporters at an engaging match. HDI Arena is located 50 miles (77 kilometers) to the northwest of Bad Harzburg. Find a Travelocity-listed room right near the sporting action at the Cityhotel Königsstraße or the Sheraton Hanover Pelikan Hotel. 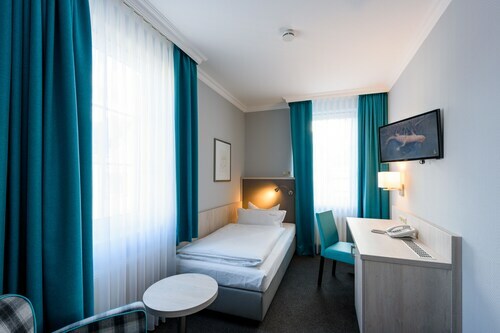 For travelers planning on arriving through Hannover Airport, you might like to stay at Leonardo Hotel Hannover Airport, or Maritim Airport Hotel, which are both located conveniently located nearby.